Unrepentant plug for a cool adventure I converted! NOTE: This is not a review in the traditional sense – it is a developer’s commentary, a preview of sorts. I try to be as SPOILER-free as possible below, but I do mention some themes and design paradigms employed. So, I worked on the latest Dolmenwood adventure, “Winter’s Daughter“ – an adventure, originally penned for the B/X-rules by Gavin Norman. In the original iteration, it clocks in at 24 pages, and I converted it to 5e, which extended the page-count to 36 pages. Why the page-count discrepancy? Well, let me explain! 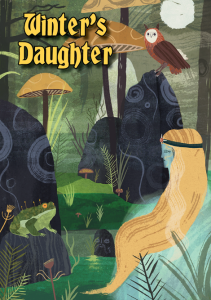 First of all, “Winter’s Daughter” is an introductory adventure for Dolmenwood, and as such, it does introduce players to several of the leitmotifs of the allcaps STRANGE Ur-forest setting. As such, the themes featured are fairy-tales and an old-world vibe, sure – but these are generously spiced with a distinct touch of the STRANGE. Not as in tentacle-studded weird fiction, but as in that they manage to evoke a jamais-vu, a je-ne-sais-quoi sense of reading something novel. One of the ways in which the original module and Dolmenwood in general convey a sense of the fantastic and unique would be the tendency to use novel and unique creatures and NPCs, and I stuck to that formula. That is, the only NPCs and monsters herein that do not get custom stats, would be commoners. Heck. Scratch that, come to think of it, I actually *DID* write custom features for commoners of a fairy race! When I am truly excited about something, I also like going a bit overboard – for example, this module features an encounter with animated objects. Well, each of them has a unique attack operation to differentiate itself from its brethren, and each of them may be defeated in special ways, sans drawing a single weapon. So yeah, that is part of the reason why my 5e-version got a bit…ähem…bigger than the B/X-version. They do have the same content! Which brings me to another aspect I stayed true to: Winter’s Daughter is an old-school adventure in the sense that it doesn’t challenge-scale the world for the PCs, and this holds true in my 5e-conversion as well. Old-school modules sometimes get a bad rep for being overtly lethal, and while this module’s 5e-version can be tough as well, that difficulty will be the consequence of the player’s actions. I did my utmost to make all non-random encounters behave in a way that allows clever players to bypass them with clever roleplaying and playing – the emphasis is clearly on player over character skill, and while you can hack and slash through this, you could also theoretically solve the adventure without any bloodshed! This module can be, theme-wise, played as a bittersweet or tragic love story of star-crossed lovers, but it can similarly turn into a happy end – the choice is all up to the players and GM/referee. If you’re peculiar about the information design and organization of the material, rest assured that all you need for an encounter, to see what’s going on, is right where you need it. Writing is terse and concise, and you won’t be bored with inconsequential trivia. So yeah, excuse me from blowing my own horn for once, but if you want to support an indie publisher, you can preorder the books here on Necrotic Gnome’s storefront until March 25th.